Now I know Facebook gets its knocks, in many cases quite rightly so, but this morning I was sat having my usual coffee and eggs breakfast, scrolling down the pages and I came across a post shared by one of my colleagues, Georgina Ramos. I went to the website (nutritiousmovement.com)of the author of this post (Katie Bowman) and started reading some of the blogs she had written. And there it was an epiphany moment! Reading some of this lady’s articles I felt like I’d met someone with my own beliefs. Read some of her stuff it’s very informative and quite humorous in places! What it also confirmed was why I had a big connection with my own colleague, Georgina Ramos…because the stuff she does in her movement classes is not just Pilates or yoga or fitness based exercises….it’s actually addressing a lot of the issues people suffer with which creates a cycle of damage to the structures of their body. Now Georgina or “George” joined us about 4 months ago and because we needed a Pilates instructor also she started taking some of our existing classes. These classes were based on classical and modern Pilates which is brilliant and is the type of classes we have offered since we opened. However, I think a lot of the class members didn’t quite ‘get’ George’s approach to these classes and numbers started to drop…which is a massive shame and a complete disrespect to this lady’s knowledge and passion for helping people move better.. If you are a person who is struggling with OSTEOARTHRITIS of the knees and hips……. 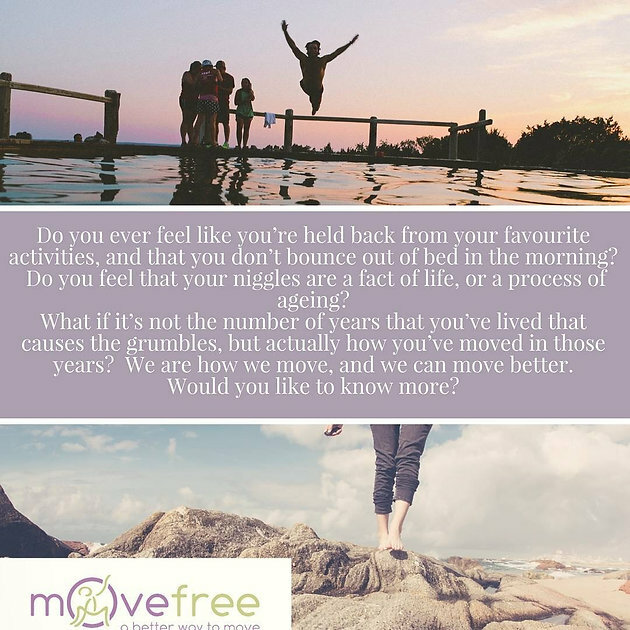 If you feel like you move differently than you did several years ago…. You don’t have to accept this! We are going to be starting some 6 week courses on how to move better with less pain, from complete beginners up to advanced sports specific benefits. Give these MoveFree classes 6 weeks to feel the difference…come and have a consultation with me and let’s see if between George and myself we can’t get you moving better, feeling better and living better!